Journalist Raissa Robles’s latest controversial tweet in the wake of Miriam Defensor’s has touched Pinoys raw nerve online and spark an outrage on Twitter. If MDS had become President and her VP had won, Bongbong Marcos would now be President. Think about it. The netizens find Ms. Robles’ tweets insensitive, despicable, rude and inappropriate at the time when the family of Senator Santiago are in the state of mourning. Twitter user identified as Dee Vee replied to Raissa Robles’ tweet and reprimanded the journalist for putting a political color to the senator’s death. Patay patay na tao kukulayan mo ng pulitika. @raissawriter patay patay na tao kukulayan mo ng pulitika. 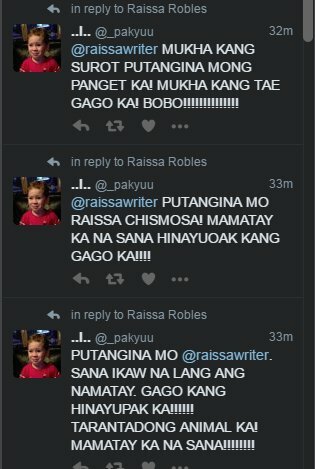 A troll couldn’t resist and bombarded Raissa Robles with a barrage of tweets cursing her. Raissa Robles did not take the troll’s tweet kindly and called the attention of her followers and attached the screenshot of the abusive tweets, perhaps to invite her followers to run towards her defense. Netizen identified as Another Asian joined the bashing party against Raissa Robles. Netizen Laudemer Beltran calls Robles ‘bastos’! @raissawriter bastos po talaga kayo! The controversy did not take long before the exchange of harsh words spills into Facebook. I could not fathom why Raissa would have to overshadow the death of one esteemed statesperson with her hatred towards the Marcoses, that she would tweet this. Instead of honoring the dead, she would raise this issue as if heaving a sigh of relief that Senator Miriam and Bongbong did not win. Despicable, to say the least. Please post your reaction or comment below. Gusto sumikat? Sige e trending nga natin! You are so insensitive Madam Raisa. Hindi lang walang budhi, wala ka pa nang kaluluwa. Dihamak magaling si Senator Santiago kesa yo. WE WILL MOURN HER DEATH, BUT REJOICE WHEN YOU DIE. That’s exactly what I was wanting to tell this stupid lady. anong klaseng ugali Meron Ka Raissa Robles!? The senator is gone and she deserves respect and so as every human being, having said that I honestly think the word doesn’t apply to u! You need to go back to school, you’re rude! hindi kaya kapatid sa labas to ni delimaw??? raissa robles like her father,new peoples army, or npa, dont expect good behaviour. Give her the benefit of what she has done!!! Let’s also talk all about raissa and her bad actions here in social media today till the time of her wake!! Pls invite us raissa on the day of your death!